Divorce Is Prohibited In The Philippines, But Moves Are Underway To Legalize It : Parallels The Philippines is one of only two countries where divorce remains illegal. But a new bill permitting it has passed the House. A recent survey found 53 percent of Filipinos favor allowing divorce. 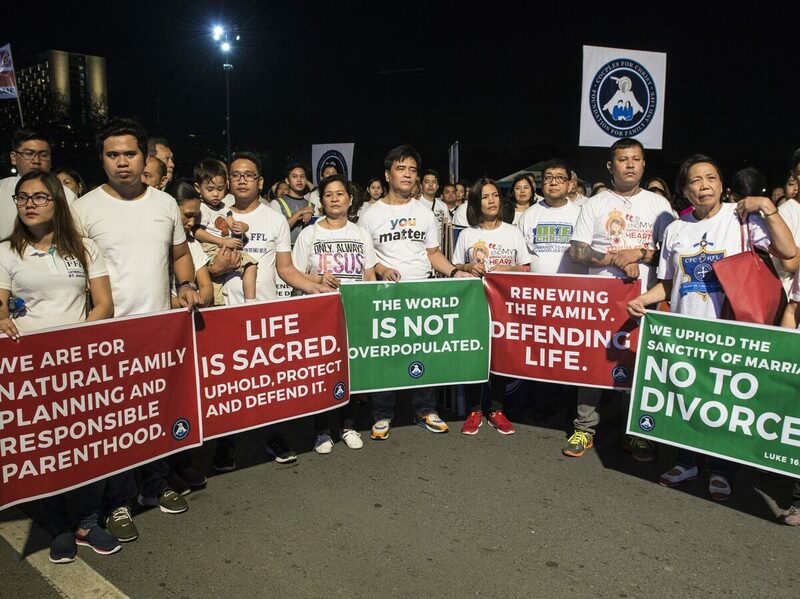 Anti-divorce protesters marched in Manila in February. The Philippine House of Representatives passed a bill in March that would legalize divorce. What Alpa Go wants — but can't get — is a divorce. The Philippines, where roughly 80 percent of the population is Roman Catholic, is one of only two countries in the world where divorce remains illegal (with exemptions for the roughly 5 percent of the population that's Muslim). The only other country where divorce remains illegal is Vatican City. With divorce out of the question, Go did the next-best thing. She filed for an annulment. But they're expensive and out of reach for many Filipinos, whose jobs bring them only a few dollars a day. Go was lucky in the sense that she'd saved enough money to try. She paid the equivalent of $5,000 to file. It didn't work. "I filed on the grounds of psychological incapacity," she explains, one of the official grounds for annulment. "But [the court] said it wasn't enough." Later, she says, her friends told her the judge in Metro Manila's Antipolo municipality, where she filed, wasn't a fan of annulments. So Go gave up. Laywer Clara Padilla, the executive director of EnGendeRights, a Manila-based nonprofit that advocates for women's rights, says Alpa Go's story is far from unusual. She has heard far worse. "Women, even if they're in an abusive relationship where their husbands would batter them, even if their husbands are drunkards or are alcoholic or engage in extramarital affairs, even if they do drugs — their wives are unable to dissolve the marriages," she says. But a bill passed in March by the Philippines House of Representatives is giving hope to proponents of divorce. It would allow divorce for a variety of reasons, including irreconcilable differences, abuse, infidelity and abandonment. To become law, the bill needs to be passed by the Senate and approved by the president. But the House bill, which passed by a vote of 134 to 57, is significant since no divorce legislation has ever made it this far in the Philippines, says sociologist Jayeel Cornelio of Manila's Ateneo University. He calls the bill "unprecedented," but also logical in a country where a recent survey showed more than half of Filipinos are in favor of allowing divorce "for irreconcilably separated couples." "The influence of the Catholic Church, when it comes to political matters and private moral affairs, is becoming weaker and weaker in the country," Cornelio says. "The resistance of the Catholic Church to the divorce bill is increasingly seen as not in the interests of the public but only the interests of the Catholic Church." Cornelio says a divorce bill is a sensible, and even "inevitable" next step after the passage of the country's reproductive health law in 2013, which allowed poorer Filipinos in particular access to birth control. Many municipalities have been slow in implementing the reproductive health law, which took more than a decade to pass — evidence of how much power the Church still enjoys. Still, there is an unusual level of bipartisan support for the divorce bill — a matter of concern for the Catholic Church. "Yes, it is worrisome for us," says Auxiliary Bishop Broderick Pabillo of the Roman Catholic Archdiocese of Manila. "According to our Philippine constitution, now we are supposed to be pro-family to protect the family, and strengthen the family, and divorce will not help our people at all." Pabillo acknowledges that there are cases where women who are emotionally or physically abused by their husbands need to get out. But in those cases, he says, "She can legally be separated from the man, so we also [offer] a way out." It's not a way that allows them a divorce to start life anew in the eyes of the government or the Church. But Pabillo is firm. "We cannot make a policy for certain cases when the whole society would suffer in the long run," he insists. Nonsense, says Padilla. She says the Philippines remains "pretty much behind the rest of the world" — in the "dark ages," even, she says — when it comes to issues like divorce and LGBT rights. "The Philippines should be a secular state where there should be separation of church and state," Padilla says, "where the Catholic Church should not be able to influence their religious beliefs in the passage of laws." The Philippine Supreme Court recently ruled that Filipinos married to foreigners can get divorced abroad and be recognized as such at home. Even though the divorce bill had strong support in the House, in the Senate, resistance is much stronger. "Unfortunately for those who are proposing it, I don't believe in it," says Senate majority leader Vicente Sotto III. "As far as I'm concerned, it's not a priority," he says, though he admits he's taking heat from his four daughters — all of whom, he says, support the right to divorce and want him to consider the bill. Sotto's own opposition, he says, won't keep him from allowing a vote in the Senate. "We'll discuss it," he says. "I am not going to stymie the bill because I'm not in favor of divorce, that does not mean I'll not do my job. If a senator comes to me and says, 'please, have it in the agenda because we want it discussed,' after discussing in committee, so be it. We'll do it." A Senate version of the bill could come up for consideration in the next few months, and both Sotto and Pabillo put the chances of passage at about 50-50. Even if the Senate does pass it, the bill would still need to be approved by President Duterte, whose own marriage was annulled. Duterte has expressed his opposition to divorce in the past. But he's also been a fierce and foulmouthed critic of the Catholic Church, when it comes to the Church's condemnation of his war on drugs, which human rights groups say has claimed more than 12,000 lives since it began nearly two years ago. If enough Filipinos make a public show of supporting a divorce bill, the populist Duterte might go along. Giving the people what they want while giving the Church a black eye, some observers suggest, might be a twofer Duterte simply cannot resist.